The craziness of life has been getting to me lately. There have been many times in the past few months where I have stopped for a brief moment and thought "is working, staying in one place, and just going through life with my head barely above water all there is to life?". We so often get caught in the routine of work, business and stress, and almost never think we can justify a break to rest and see what's out there beyond the horizon. As a creative, I long for that sense of adventure and unknown. It is integrated into my very being. I was created to explore. I cannot explain it. I just know it. This past weekend, I had the opportunity to visit a few friends of mine in South-Central Kentucky. I had never met them before, but being somewhat outgoing and what-not, still wanted to go hang out with them and explore the area. I met them through Instagram and had developed a friendship prior to making plans for a visit. Most people think "Isn't everyone online a creep? Why would you just go meet someone and hang out with them? That's weird!" Not me though. I love the opportunity to meet new people, network, and get to know people as friends and no just a mutual "follow" on social media. So, I drove down to Russell Springs, Kentucky, and met my fried Justin. The next morning, we packed out backpacks, laced up our hiking boots, and hit the road. Our destination was a place Justin referred to as "Narnia". I went with it, knowing that he had a plan and wasn't going to take me somewhere lame, since he wanted to show me the best places in the area. 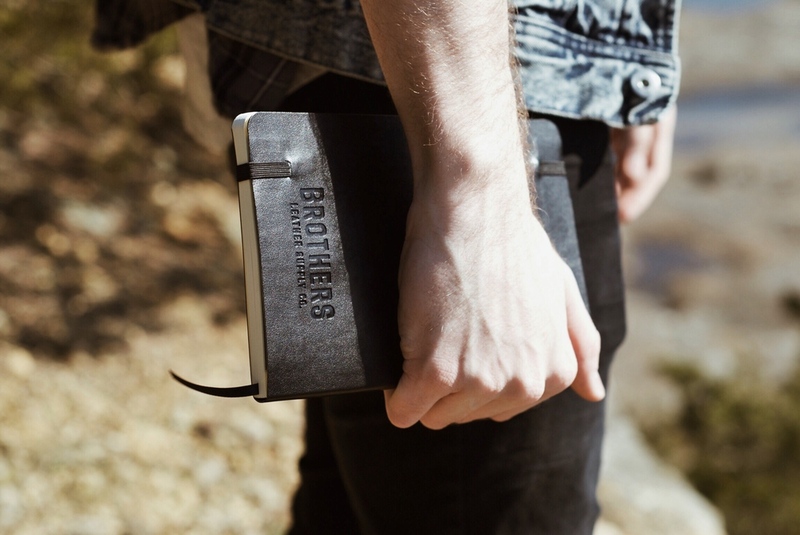 product photo - brothers leather co.
After our coffee stop, we hit the road and drove out to Green River Lake. Before going out to the lookout in the middle of the lake, we stopped at a place Justin referred to as "Narnia". Narnia is a giant ravine cut into the ground that looks out over the lake. We walked down the wide open space, and made it to a little entrance into the woods. After hiking up to the top of the ridge, we stopped to take in the sights. I am still in awe. This place was beautiful. Truly. We marveled at how great God is for creating such incredible places for us to enjoy. After exploring one side of the ravine, we walked across the the wide gap and hiked up the other side. The lighting was not as harsh on this side, and I took advantage by taking a few portraits of Justin. The day was warm and windy. After we hiked back down the cliff, we drove out to the lookout in the lake. The wind was even more crazy out here where there was no cover. We did our best not to let our hats blow away into the water. As the day was wrapping up, we stopped at one more location. The "Spillway". Basically, there is a super long dam, that controls the water from the lake, to the river, and it all goes through this massive spillway. The birds flock to this area because the water is being tossed around and fish are everywhere. We sat and watched the birds from the rocks and also took a few photos on the road that runs on top of the dam. Thus ended our day of adventure. We hit up the local BBQ place and headed back home to edit, play some ping-pong, and get some rest. At least that was the intent. We ended up talking for hours. It turns out, Justin and I are the exact same personality type according to the Myers-Briggs personality test. We share a lot, almost all, of the same interests, hobbies, dreams, goals, and thoughts. The feeling of knowing someone gets exactly what you feel as an artist and creative is refreshing. I didn't know other people felt stuck creatively, or similarly to me, and it was good to have a conversation with someone similar to me. Thanks for reading and following along with my story. Please feel free to share, comment, and let me know what you think. Also, go follow @justinkyleroberts on Instagram and check out the brands mentioned in this post.